Executive, spacious vacation home. The perfect vacation spot for you and your family. Large 3 bedroom, 4 bath home located less than a one minute walk to the white powdery sands of Kailua Beach, which by the way, is great for small children. The water is calm since there is a coral reef 1/2 mile off shore, where the waves break. You can snorkel, swim, kayak, or just walk the beach for hours. You can also watch the sun rise in the morning over the ocean and the moon rise in the evening. It is truly breathtaking! Dolphin Manor is a one of kind, it has a private gorgeous swimming pool, air conditioning, 2 washers/dryers, free WIFI, free gated parking, a full modern kitchen with granite counters, gas BBQ grille, and more. There are 2 king beds, 2 double beds, a queen sofabed, and 2 twin futons, which can be put anywhere in the house. We can also provide a crib and/or pack n' play for a child. I'm writing to thank you for letting us use your beautiful home this summer. Dolphin Manor was very clean and comfortable and felt very at home. We basically spent most of our time swimming in the beautiful Kailua beach. We saw a sea turtle a few times! We also loved the beautiful pool !! It was a dream house for all of us. We all wanted to live there! We are already talking about our second visit to Dolphin Manor!! 'We really enjoyed our stay at your beautiful home. The location was perfect and you had everything we needed. The pool was awesome and the house so close to the beach! Can't wait to come back next year and stay with you. Thank you again for everything!! Brian and Cindy A.
Steve and I lived in Colorado for 10 years and had our first child, Sharly. She was 3 months premature and weighed in at a whopping 1 pound!! When she turned one, she weighed almost 10 pounds. Her doctor said that she would grow if we moved her to a warmer climate.. that it was difficult for her to maintain a 98.6 degree body temperature without burning so many calories. So, we moved to Hawaii.. with $500 in the bank and our little daughter. That was in December, 1979. And here we are 36 years later. Sharly has since married, given birth to our grandaughters, Kaylee and Riley, and has moved back to Colorado. We had our son, Zak after moving to Hawaii. He married his high school sweetheart, Amber, and they have 2 sons. And, he just began working for us full time! There's more to the story, so come and stay with us to hear the rest. We love our guests and have many repeat visitors to our lovely rentals. We used to own a small travel agency and people were always asking if there was anywhere to stay other than Waikiki. So we decided to rent out some rooms in our home to accommodate our clients and to make a little extra money. There were no hotels in our town and the beach was just gorgeous. Little did we know that Kailua would become such a wonderful vacation destination. Refrigerator has ice maker and filtered water. New modern kitchen with granite counters, tiled floors, refrigerator has ice maker and filtered water. (3) High Def LCD TV with most all of the movie channels. Great Location. Short 2 minute walk to White Sandy Beach, Oceanviews, Swimming Pool, 2 Jacuzzi Tubs, Digital Cable TV with HBO, 30 music channels, High Speed Wireless Internet, Modern Gourmet Kitchen, Central Air Conditioning, 500+ thread count Linens, Gas BBQ, Gated for Security, 3200 sq, ft, Lanais off of every bdrm, Bikes, Boogie Boards, Beach Chairs, Mats, Towels, and Toys....ENVIRONMENTALY FRIENDLY PROPERTY WITH SOLAR HOT WATER. WE RECYCLE, AND USE ENERGY EFFICIENT APPLIANCES IN ALL OF OUR RENTALS. This was a perfect spot for our family vacation-Kailua beach was great for small children, and the location was convenient to many of the places we wanted to visit on the island. The house was well-supplied with towels, paper goods, detergent, shampoo, pool and beach toys, beach chairs, 2 boogie boards and more. The pool was a little cool when we arrived in mid-march, but warmed up the following week. There were a few amenities that could use updating (the blinds did not work well, the balcony seemed unsafe to use, and the bikes could use repair) but the house is very comfortable. We especially enjoyed the ceiling fans in every room. Zak was very responsive anytime we needed something. We found Buzz's Steakhouse disappointing (we ordered fish), and the cinnamon rolls at Cinnamons were very small. We especially liked Tokoname Sushi Bar & Restaurant; Mexico Lindo was good, as was Grylt. Our family gathered at the Dolohin manor for a family vacation. We found the house a perfect match for us. The house is in a perfect spot. Very close to the beach with a gated driveway which gave us plenty of privacy. The house was well stocked with towels and bedding and the kitchen had everything we needed for the simple meals we prepared. The owners were available when needed but respected our family time. I would highly recommend this house for a family looking for a relaxed Hawaiian vacation in a beautiful place. Great location but house definitely needs some attention! 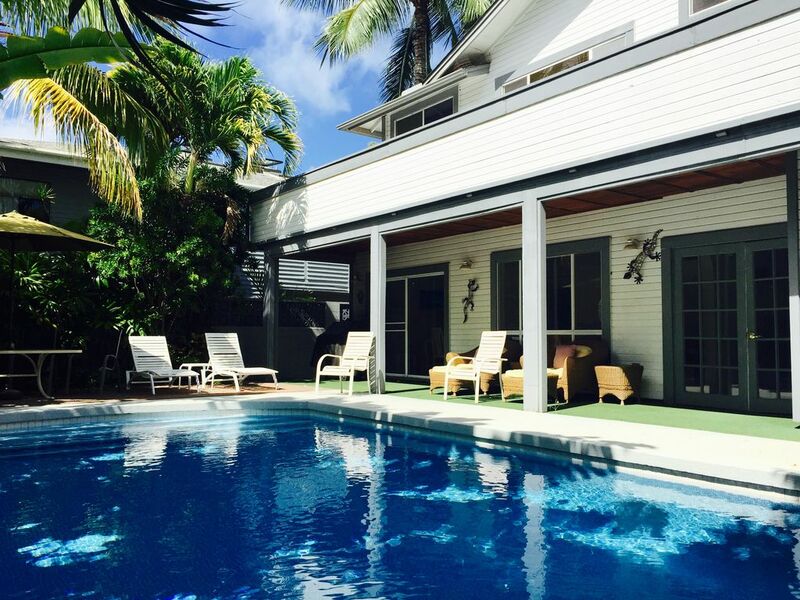 Dolphin Manor is conveniently located across the road from Kailua Beach and having a nice backyard pool were the two positives of our stay. We traveled as a family of 9 people (3 generations). The house itself is tired and in need of maintenance. First impressions are everything! The eavestroughs are old and leaking all around the house and the exterior could use a good powerwash. The upper decking off the bedrooms is so rotted we didn't dare walk out there. Interior doors need a good clean and the windows, sliders and blinds are old and in bad shape. The master bathroom shower was unusable due to corroded taps. For the price, and comparing it to a similarly priced house we rented on another island, we were disappointed. It was great to have access to a few bicycles and there are lots of beach toys along with chairs to take to the beach! Everything you need is right here ! We loved that the best beach is right across the street and the park is great for families. Nice for bike riding or walking early in the mornings when the sun rises. The house was spacious and we were a group of 6 adults. It was nice that there were two washers and dryers and plenty of parking for two cars behind the driveway gate. The pool was a bonus. We thoroughly enjoyed our visit to Oahu ! Great location! Perfect fit for our large family! Zak was a great host and the property was wonderful. Had everything we needed!